Spartan 2.0 over-delivers yet again. What I appreciate about Spartan as a company and product line resembles what I hold to be of utmost importance in a brand and corporate vision: constant improvement, customized adaptation, community dialogue. Spartan takes the feedback we provide placing their gear in unique, new and ongoing duress, and maintains a state of continual evolution. As a grappler competitively, and a contact and control specialist for defensive tactics, gear becomes problematic. We grapplers took the rashguard out of beach attire and made it an industry. 😉 We are hard on gear because of snags, tears, and friction. But Spartan returned from our feedback with an innovative response to the duress we place upon gear. The elbow forearm guards represented one of the most frequent points of contact and we continually would release attachments, if not be obstructed by them. The new design resembles a padded compression sleeve, allowing maximum mobility and operation of the arm while minimizing if not preventing any friction or possible gear malfunction. Genius. Groundfighting, standing up from the ground, engaging cover, takedowns and tackles all present problem in multi-piece gear. If you cannot render the actual skills to be performed, then training gear becomes a liability: for the best you can hope for in a fight is the worst you’ve performed in the gym. The interference between upper and lower architecture of training gear has in the past been an obstacle. Certainly, we will overcome any discomforts, but when accessing and deploying tools and techniques, integration of equipment without any obstruction to mobility is paramount. The new low-profile elastic waist and the removal of the previous plastic band no longer interrupts the movement between the vest and the shorts. Ideal. Any law enforcement personnel knows how to dismantle the closures on their vests. And as instructors we know that under fatigue and stress we do what we’ve conditioned the most. This includes the removal of our gear. In the past we’ve put some serious wear and tear on the gear by not removing as per spec designs… because inadvertently under fatigue and stress of drilling, we started removing the training gear as one would body armor. To address this, Spartan 2.0 developed an ingenious ballistic style front closure which not only increases rib protection and fits better, it prevents us from causing product malfunctions. Thank you. Previously designed helmets addressed the potential harm of impact, but often neglected to consider how grapplers use the head to control the body. This resulted in releasing the attachment points to other designs. But Spartan 2.0, and I don’t want to give away any corporate secrets, has implemented a design which I cannot yet Hoodini. I’ll keep trying, but I haven’t found a way to release this head gear even under high intensity. Keep your eyes on this helmet. Best on the market. One last interplay I wanted to address was the relationship of the new elbow sleeve to the shoulder and wrist. 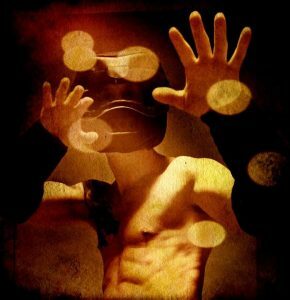 As a grappler, I often establish wrist control – which is also a necessity in cuffing and restraint. Without amble opportunity for application of wrist control (and wrist restraints), training gear can interfere with skill practice, especially under stress of high intensity drilling. The new design of the sleeve works optimally in relationship between the gloves and shoulder pieces. Much appreciated. Again, my kudos to Spartan for remaining the industry leader by engineering evolution. It will take quite a few years for others to catch up to these innovations. “Just a few words to tell you how genuinely impressed I was by the Hoplite Training Armour we received recently. Having done hundreds of hours in gear over the years, I found the features you have incorporated into the armour made my training session flow much more smoothly. The arm components, areas which are subject to the most movement and impact, have very neat features to make sure they stay in place and can withstand high-intensity training. The features you have built in to make the armour so secure on the body do their job very well. Likewise with the head protector. Overall the design makes it easy to ensure a snug fit which is comfortable and allows movement, while providing all-round protection without gaps. Outstanding. I even tried my best to fog up the visor but whatever magic is in there, I could see clearly through it at all times. One of the key things we have found is that we can now do multiple drill repetitions and not need to re-adjust or re-affix anything between them. Whether I am in the training scenario or I am helping my students through it, we have more training time and less adjustment time – more reps means safer students and that is a really great benefit which shouldn’t be forgotten. Great job – our Hoplite Training Armour from Spartan is now our most essential equipment. “Well I gave the Hoplite Helmet the run through it deserved. After being mauled by angry women, multiple black belts, and a 328lb. monster for a total of about 6 hours… my face and head are 100% in-tact. I was shredded, elbowed, palm struck, kneed in the face, and skull bounced… all of which I felt, but none of which actually hurt me. It was fantastic! I was really surprised at how light and comfortable the helmet is. There was complete freedom of movement, clear peripheral vision, and excellent ventilation. After hours of training, the helmet never became unbearable. Further, the helmet stayed attached during extremely vigorous ground recovery drills… a failing of every other helmet I have tried. President – Fight Like a Girl Inc.